I thought that I�d actually have a stab at reviewing the pub rather than the staff and clientele. First and foremost half a Carling costs �1 and I didn�t spot any signs advertising a happy hour. There was an overpowering smell of disinfectant, but I didn�t mind as my drink only cost �1. Lots of screens and football advertised on blackboards around the pub and a pool table is situated at the rear of the pub next to the back door emblazoned with fire exit signs. There are a few chairs and tables under a canopy on the pavement outside, but I don�t think that there is a beer garden of such. It�s not the sort of pub that I wouldn�t imagine having a coffee machine behind the bar, but it does and a couple ordered some and drank it with no complaint (unlike Shackology up the road). The usual lager suspects are on offer alongside Strongbow, Courage Best and Directors (this is not an exhaustive list of the selection). 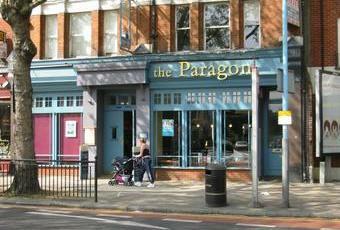 The Paragon is a little tatty around the edges, but if I lived in the area I would watch the football there. Hi, thanks for taking an interest. Please review my blog or facebook for up to date pictures and news of me. My phone numbers still the same if you want details. And yes i still enjoy a vodka! Gosh, i do hope your well, it seems ages since we traded insults in person. come see me it'll be fun. X X, p.s. i've grown hair but am still fat! Well James I see you are upsetting every girl that comes near you!!!! Still leering over anything in a skirt or trousers aslong as its female! Are you still bald and fat? Still drinking heavily and smoking like a chimney? a freind of mine still reckons you are revolting I can think of stronger words!Anyway love to all and good luck in your next adventure I'm surre you will ruin it aswell as the rest if not better!! judging from the comments below - no wonder this place is for sale!